Larry Parnes | All You Need Is News! Laurence Maurice “Larry” Parnes (3 September 1929 – 4 August 1989) was an English pop manager and impresario. He was the first major British rock manager, and his stable of singers included many of the most successful British rock singers of the late 1950s and early 1960s. Parnes’reputation has been damaged in recent years by testimony from many of the artists he managed in the late fifties and early sixties who were ruthlessly exploited, often worked to exhaustion on pay which was a tiny fraction of the profit he made from their talent. Shortly before his death, Parnes told an interviewer that his one regret was ‘not to have looked after his bank balance better.’ By this time Billy Fury had died in poverty having made him a fortune.Parnes was born to a Jewish family in Willesden, London. After leaving school he began work in a clothing store, and by the age of 18 ran a women’s clothing shop in Romford, Essex. He then bought a share in a bar in Romilly Street, Soho. He agreed to invest in a touring play, The House of Shame, which became both successful and notorious in 1954 after its publicist, John Kennedy, persuaded two actresses to stand outside the theatre dressed as prostitutes. In 1956, with Kennedy, Parnes began to manage young rock and roll singer Tommy Hicks, who anglicised the name of his Swedish grandfather to become known as Tommy Steele. 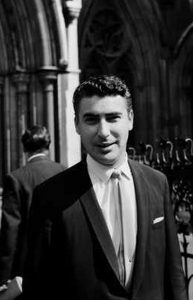 Steele achieved popular success, some of his songs being co-written by Parnes’ friend Lionel Bart, and Parnes succeeded in presenting Steele as an “all-round entertainer”.Parnes claimed in a court action that he and Kennedy took 40 per cent of Steele’s “gross takings”, out of which they had to pay 10 per cent to booking agents as well as the costs of Steele’s accommodation, advertising and publicity, travel and other aspects “needed to keep Tommy on the road to stardom”. This became the standard arrangement with Parnes’ artists. After Steele’s success, Parnes looked to find other young men who he could groom to become pop stars. At Bart’s suggestion, he next signed Reg Patterson (né Smith), whom he re-christened Marty Wilde, and who also rose to pop stardom in the UK. Parnes developed a network of contacts within the British recording industry and entertainment business, with leading British songwriters providing songs for his growing stable of talent, and many of his protégés achieving success in the British pop charts. A flamboyant gay man, Parnes’ approach was to select, and then groom, handsome young men who would be attractive to a teenage audience. He also gave them new stage names, which were rumoured to reflect what he considered to be their sexual characteristics. Among those he managed with at least some degree of success were Billy Fury (originally Ron Wycherley), Vince Eager (Roy Taylor), Dickie Pride (Richard Knellar), Lance Fortune (Chris Morris), Duffy Power (Ray Howard), Johnny Gentle (John Askew), Terry Dene (Terence Williams), Nelson Keene (Malcolm Holland), and Georgie Fame (Clive Powell). He also managed Tommy Bruce, and Joe Brown, who he failed to persuade to change his name to Elmer Twitch.